WILLEMSTAD - The financial institution SONA filed a lawsuit against the construction company Ballast Nedam. 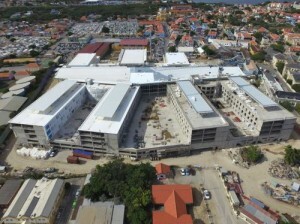 The client, who is constructing the new hospital on behalf of the government, wants to get rid of the 31 million claim placed by Ballast Nedam for future expenses. Ballast Nedam wants to be so sure that the remaining construction expenses will be paid. The government will be the guarantor, according to health minister Suzy Römer.